There are two main types of battery operated controllers. The first type of controller looks and performs like a standard irrigation controller. It is powered by (2) 9 volt batteries. It is a DC current controller and requires that the valve it operates have a “latching DC” type solenoid. This special solenoid can be purchased separately and replaces the solenoid that originally came with the control valve. This type of controller will not run AC type solenoids so be sure to get the same model replacement “latching DC” solenoid that fits your valve type. Refer to the manufacturer’s operating instruction manual for maximum wire run distance from the controller. 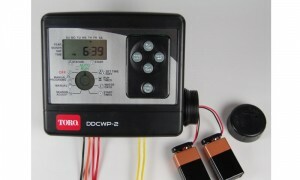 The second type of battery controller is for operating only one valve. It is installed directly into the solenoid port on each individual valve which is typically within a valve box. This can make accessing and changing programming difficult. Water scheduling, run time features and programming typically function much like a standard electric irrigation controller.